Dolphins are the entertainers of the ocean. They are very playful which makes them very popular. You can see them jump out of the water, riding the waves and sometimes even interacting with people swimming. Dolphins are very smart and social animals. They live in pods of 12 or more dolphins. The bonds of dolphins in a pod are very strong. They have been observed carrying for the sick, the elderly, and those that have been injured with great care. Dolphins enjoy socializing and playing. They play with seaweed or with other members of the pod. Sometimes, they will tease other living creatures in the water. Dolphins have been known to rescue people in trouble on the ocean and even help fishermen with fishing. To breathe, dolphins use blowholes on top of their heads. They have very good eyesight and hearing and use echolocation for finding the exact location of objects. Dolphins have 100 teeth which they use to catch food and afterwards swallow it whole. Dolphins communicate with each other by clicking, whistling and other sound. Dolphins are in danger of extinction because of humans. Some countries are known to hunt for dolphins for their meat. Fishing nets, longlines with hooks, collision with boats, habitat destruction and pollution of the ocean kill large numbers of dolphins each year. 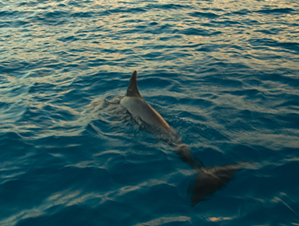 The Bottlenose Dolphin (Tursiops truncatus) is, alongside the Spinner Dolphin (Stenella longirostris), the most common dolphin species that migrates through the waters of the Dutch Caribbean Islands. It is a large dolphin, up to 3 m (~9.8 ft) in length, and has a light to dark grey body and white belly. It gets its common name from its elongated snout. While the Bottlenose Dolphin is not considered to be an endangered species, it is however listed in Appendix II of CITES and is therefore protected from international trade to ensure that it does not become threatened with extinction in the near future.